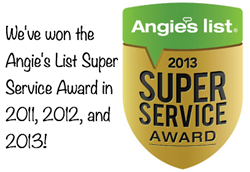 Phoenix Auto Glass Replacement & Free chip repair will be offered on all newly installed windshields by SafePro Auto Glass as they celebrate winning the coveted Angie’s List Super Service Award for the third year in a row. Free chip repair will be offered on all newly installed windshields by SafePro Auto Glass as they celebrate winning the coveted Angie’s List Super Service Award for the third year in a row. SafePro’s award-winning service includes first-rate workmanship, the use of top-quality glass and adhesives, and having documented on-time installations. SafePro Auto Glass has served more than 500,000 customers in Arizona since Altree and his wife, Debbie, started the company 16 years ago in 1998. The largest family-owned Phoenix windshield replacement business, SafePro offers statewide service and a lifetime warranty that covers the U.S., Canada, and Mexico.